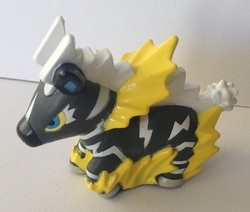 Blitzle and Zebstrika are 2 of the newest pokémon from the latest series of games. 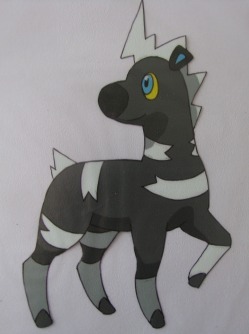 They are black electric-type zebra, and are absolutely glorious! They were the first Generation V pokémon I decided to actively collect, which is why I have so many customs! 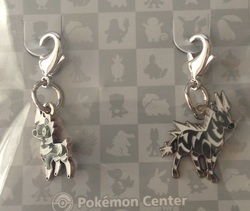 A cute set of charms from 2012, when the Pokémon Centre ran a promotion where all pokémon got these cute charms. LOOK AT IT. Holy hell. When this baby was announced, I knew I had to have it, and she is all I could have ever wanted. She's soft, cute and perfectly formed - GET ONE. 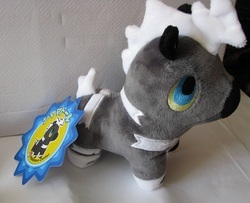 This is my favourite Blitzle plush. 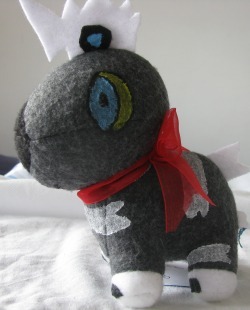 He's absolutely perfectly proportioned, made of a soft Velboa material and and super, super cute! 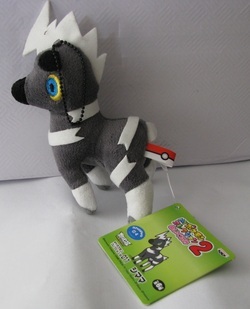 For the Unova pokédex, The Pokémon Company have done something they haven't ever done before - they're making at least one of these pint-sized Minky plushies for EVERY pokémon in the pokédex! Super cute, tiny and perfect. I love this little girl! 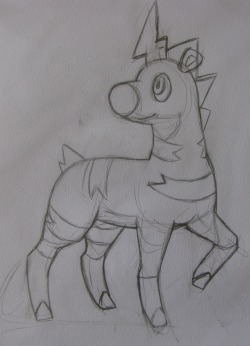 The cute little chibified Blitzle. A hollow plastic figure made by Bandai, roughly 1.5 inches tall. 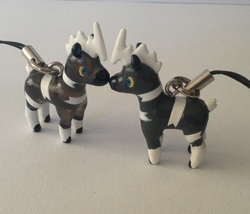 These are super cute phone straps/charms, one clear and one normal, both around 1 inch tall. This is Faith! 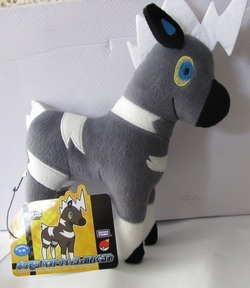 She is a custom Blitzle Pokédoll, made by starlighteevee. I absolutely love her; she's beautiful! 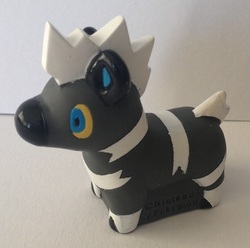 A little tiny and cute minky Blitzle charm, made by the lovely usakochan. Both this and the cel below are by the extremely talented silversnowcloak @ LJ, and she sent them to me as gifts. What an amazing friend - I was having a supremely bad day, and these arrived and turned it all around. The sketch that lead to the cel above. So amazing! 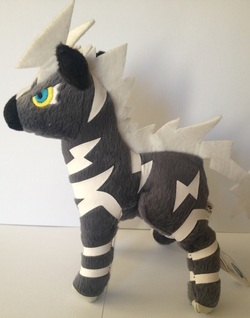 This plush was made for the recent movie I think, and is soft and adorable. She's about the same size as the MPC plush above. 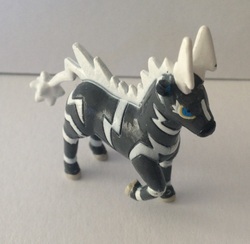 The cute little chibified Zebstrika. A hollow plastic figure made by Bandai, roughly 1.5 inches tall. 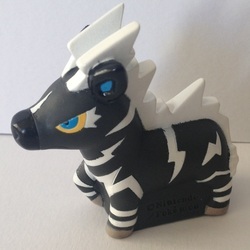 The cute little chibified Zebstrika, attacking with volt tackle. A hollow plastic figure made by Bandai, roughly 1.5 inches tall. 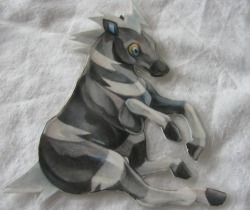 A teeny tiny zebra, roughly 1CM tall, and made of plastic. She is so cute and perfect consider her size. This was sheer luck - I bought a blind packaged stamp and got this one! 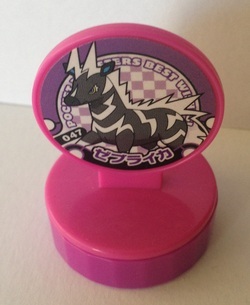 It's my favourite pokémon and a gorgeous colour. The stamp is the same as the image, and is used on my sales parcels at every given opportunity.